A legal process to repay less than what you owe on your unsecured debts. Not all debts can be included in a Consumer Proposal. 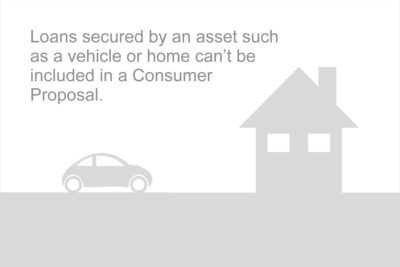 Secured debts, like a car loan, can’t be included in a proposal. Assets tied to secured loans may need to be sold when someone enters into a Consumer Proposal because someone isn’t able to manage the payments any longer. Other times, creditors won’t agree to a proposal if someone has assets they can sell to pay back the full amount of what they owe. Student loans often can't be included, especially if it has been less than 7 years from when someone stopped studying. While someone is making payments on their Consumer Proposal, student loan payments aren’t required. However, interest is still added to the student loan during that time. At the end of the proposal, someone may owe more on their student loan than they did before they filed the Consumer Proposal. If your creditors accept your proposal, that is only the first step towards resolving your financial difficulties. Many people who enter into a Consumer Proposal have so much difficulty keeping up with monthly payments that their proposal collapses. Once that happens, they are left in limbo being unable to file another proposal and having to consider other options, including bankruptcy. At this point, creditors will then proceed with collecting on what is still owed. This can include legal action. While a Consumer Proposal is a legal arrangement and a matter of public record, it is also noted on your credit report. It is recorded there for the time it takes to repay your Consumer Proposal plus an additional 3 years after the proposal has been successfully completed. How a Consumer Proposal affects credit will depend on what else is on your credit report. However, generally speaking, it is a negative notation. It pulls your credit score down plus the notation will typically discourage most lenders from granting you credit until it is lifted. Just like with other debt consolidation options, a Consumer Proposal is a good fit for some people, but not for everyone. It depends on a number of factors including if you are working, the type of debts you have, how much you owe, your occupation (in some cases), your financial goals, and your overall financial situation. To help you figure out if filing for a Consumer Proposal is the best option for you, contact us. We'll help you look into all options that may be available to you. One of our Counsellors will be happy to carefully look over your whole financial situation with you and answer any questions you may have. Our appointments are free, confidential, and non-judgmental. Call us at 1-855-232-4888.